"Maximize the storage space in your new shed by hanging some salvaged kitchen wall cabinets on one or more walls." DEAR TODD: Storage sheds are popular in my neighborhood, so I can understand why you're thinking about building one. Is Sloping Ground a Shed Dealbreaker? No, most lots have a slope to them. The sloping ground is present on a vast majority of building lots. Even ground that appears flat typically has 1 or 2 inches of fall across a distance of 10 or 12 feet. The only place I feel the ground has to be slightly level after the shed is built is just in front of the entrance. A level spot in front of the door will help prevent mishaps as you enter and exit the shed. What's the Best Shed Floor? A concrete slab is an ideal floor, but treated lumber joists and treated plywood are a photo-finish second place. Frequently, I find that people get stuck in a mental rut when it comes to home improvement projects. It sounds as if you might have had a concrete slab in mind as the floor of your new storage shed. There is nothing wrong with concrete, but consider the possibility of your new shed as an outdoor deck that simply has a building on top of it. Can Wood Storage Sheds Support Lots of Weight? Many storage sheds have wood-floor systems that support very heavy weight and perform exceptionally well over time. In fact, many large barns have wood floor systems that support very heavy loads. Do I Need the Approval To Build? You need to determine if you're allowed to build the storage shed. Local zoning laws and subdivision restrictions may prohibit outdoor sheds or restrict where on your property they can be built. Often the best location on your lot for a shed is not where you are allowed to build it. 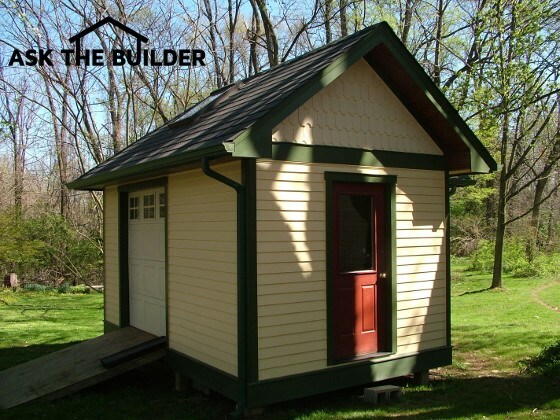 You may have to obtain a zoning variance in order to build the shed. A variance is a formal permission from the zoning officials in the event you incur practical difficulty in trying to obey the zoning laws. What Do I Need To Get the Approval? Before you travel to the zoning department, be sure to create a simple plan of what you intend to do. It is easy to size a storage shed. How Do I Plan For the Right Size Shed? Clear a spot in your lawn or in your driveway. Comfortably arrange all of the things such as your lawnmower, wheelbarrow, bikes, and any other item that will occupy floor space in the shed. Place the items on the grass in such a way as they are not cramped and you can get to them with little effort. Note the width and the length of the area these items are occupying. My guess is you will quickly determine you need a shed 10 or 12 feet wide by 12 or 14 feet long. What is a Treated Lumber Shed Floor System? 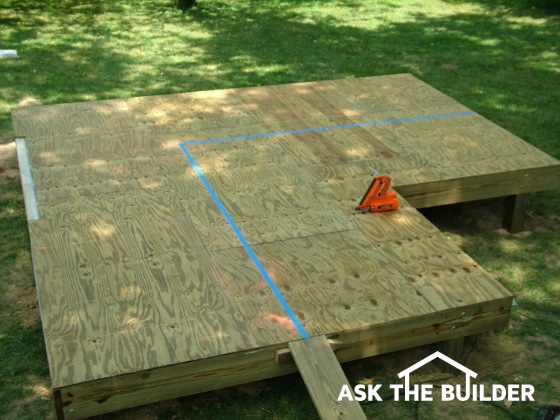 If you decide to build the shed floor using wood, be sure you use floor joists and plywood that are chemically treated. It's a good idea to use Alkaline Copper Quaternary (ACQ) treated lumber. This lumber is rot resistant, and wood-destroying insects avoid it like the plague. 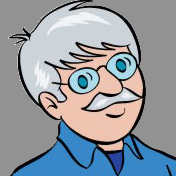 I prefer using chemically-treated plywood for the floor of the shed as I do not have to worry if I store wet or snow-covered garden equipment. The water that gets on the floor will not harm the wood whatsoever. Should I Include a Vapor Retarder to Stop Rust? To prevent rust on equipment stored in the storage shed, you need to block water vapor that tries to migrate from the soil through the floor of the shed. Just before you install the treated plywood subfloor on the joists, place two layers of vapor barrier on top of the joists, and let it overlap the edges around the entire subfloor perimeter. Stretch it tight and tack it onto the joists. Be careful not to tear the vapor barrier as you place the sheets of plywood onto the joists. This layer of plastic will stop water vapor from seeping up into the storage shed in the winter months. If the floor of the slab is concrete, place this same vapor retarder on the soil just before you pour the concrete slab. How Can I Get Extra Storage Space? Maximize the storage space in your new shed by hanging some salvaged kitchen wall cabinets on one or more walls. You might find great cabinets at a garage sale or even a closeout sale at a local kitchen cabinet supply house. Should the Shed Have Electric in It? Lighting is also very important. You may want to extend a buried electric cable to the shed. Extending electricity from your home will allow you to install lights and electric receptacles. This power will come in very handy for battery charging, power saws, pumps, and any other tool that requires electricity to operate. Be absolutely certain you follow all National Electric Code requirements with respect to this aspect of the project. Storage sheds are often too small. A 10-minute trick can ensure your shed is large enough for everything you store in it. GREAT VIDEO here. Tim, I remember reading in one of your columns where someone had done a shed wrong. Either they had left 1" of subfloor showing all the way around, or they had over hung their shed. But I can't remember which was wrong. You said something about water the way it was done.